How do we know what colors animals perceive? If say photons with wavelengths of around 530 nanometers hit the human retina, this would lead to the perception of the color conventionally called "green". The color "green", however, is subjective in the sense that it is bound to a certain cortical physiology. So my question is: Given that we don't have access to how animals perceive color, as we can't infer such qualitative properties purely from physical stimulus properties, how can we conclude that some animals are, say, perceiving ultra-violet colors given certain items or wavelengths? What if they would perceive entirely different colors than known to us? inspect their cones to determine what wavelengths they could perceive. The latter doesn't necessarily imply that if an animal has say 4 different cones, it has tetrachromatic vision, because there's some degeneracy in some species, which unlike in humans (which have 3 types of cones and trichromatic vision) don't really use all their cones. The colour vision of domestic chicks (Gallus gallus) was investigated by training them to small food containers decorated with tilings of grey and coloured rectangles. Chicks learn to recognise the colour quickly and accurately. 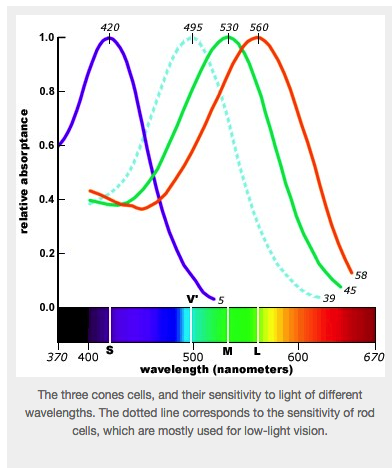 Chicks have four types of single-cone photoreceptor sensitive to ultraviolet, short-, medium- or long-wavelength light. To establish how these receptors are used for colour vision, stimuli were designed to be distinguished only by specific combinations of receptors. We infer (1) that all four single cones are used, and (2) that their outputs are encoded by at least three opponency mechanisms: one comparing the outputs of ultraviolet- and short-wavelength-sensitive receptors, one comparing the outputs of medium- and long-wavelength receptors and a third comparing of the outputs of short- and long- and/or medium-wavelength receptors. Thus, the chicks have tetrachromatic colour vision. These experiments do not exclude a role for the fifth cone type, double cones, but other evidence suggests that these cones serve luminance-based tasks, such as motion detection, and not colour recognition. If you want to get philosophical qualia discussions, akin to whether all humans describe the same color with same language, that's a whole different kettle of fish. I don't know of any studies like that in the absence of language. I'm guessing you might be familiar with the dress. Not the answer you're looking for? Browse other questions tagged neuroscience perception color or ask your own question. How do humans perceive height or vertical drop? Why do “cool” colors, which are actually warmer, look cool, and vice versa? Do people perceive opacity of a color linearly? Why do colors affect emotion?